The new policy doesn’t grant anything close to fair and equal treatment under the law for transgender people. After several of attempts, legislators were pushed by the NCAA’s Tuesday announcement that the state had two days to repeal HB 2 or face losing championship and tournament games through 2022. For enough legislators, the pitch worked this time. But make no mistake about it: Despite being framed as a “repeal,” the new policy is still very much discriminatory, and doesn’t grant anything close to fair and equal treatment under the law for transgender people. 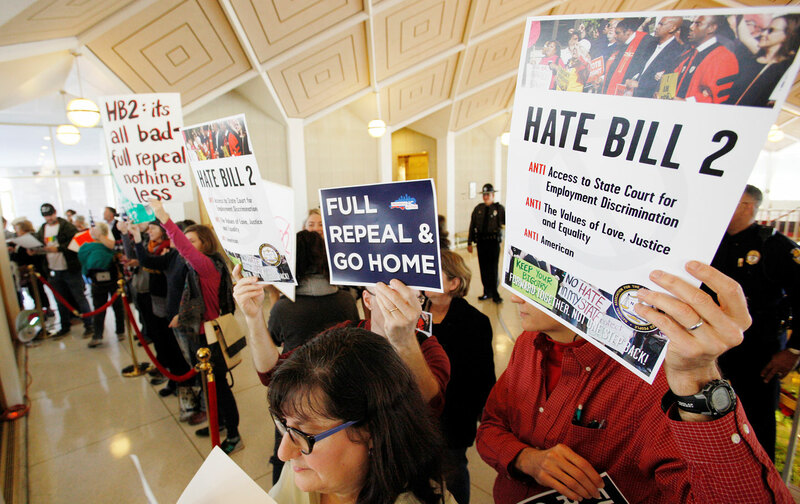 While the deal did technically repeal HB 2—commonly known as the bathroom bill, it also did grave damage to civil rights. The new law prevents any state agencies—including local school boards—from creating their own rules allowing trans people to use the bathroom associated with their gender unless the rule is “in accordance” with a law passed by the General Assembly. Given the Republican supermajorities in both chambers of the Legislature, won with “illegal racial gerrymanders,” don’t expect that to happen anytime soon. Moreover, it put into place a four-year moratorium on creating or amending non-discrimination ordinances regulating public accommodations and “private employment practices”—i.e., living-wage ordinances. Virtually no one liked the bill. On the right, the powerful social conservative interest group NC Values Coalition released a statement in the morning “encouraging lawmakers to stand strong” in support of HB 2. Although they were outnumbered, 33 House Republicans and 10 Senate conservatives ended up voting against the final bill. “[The LGBTQ community] would rather suffer HB 2 than have this body, one more time, deny us the full and unfettered protection of the law,” Butler said. But the Democratic leadership in the House and the Senate sided with the governor, as did a majority of both caucuses. Only six Senate Democrats out of 15 voted against the deal, while 15 House Democrats broke with 30 of their colleagues and did the same. Paul BlestTwitterPaul Blest is a journalist living in Raleigh, North Carolina. He's a former staff writer for INDY Week and has written for The New Republic, Jacobin, VICE, The Week, and others.